(CNN) - The independent political group supporting President Barack Obama’s agenda will on Thursday release a new television commercial promoting the successes of his signature healthcare law. Entitled “Every Day,” the Organizing for Action ad tells the story of a Huntersville, North Carolina, family who received an insurance rebate because of reforms implemented under the Affordable Care Act. The commercial features parents Rebecca and Russell telling their family’s story. Rebecca begins by saying that soon after her son, Liam, was born she received a renewal notice from their insurance company saying their premiums were going to increase. “It’s nice to see somebody’s looking out for the little guy,” Russell says. “The law works,” Rebecca says, closing out the ad. This is the group’s third television spot in support of the president’s health care law, and it’s part of a paid-media campaign that will total more than seven figures by the end of the summer. 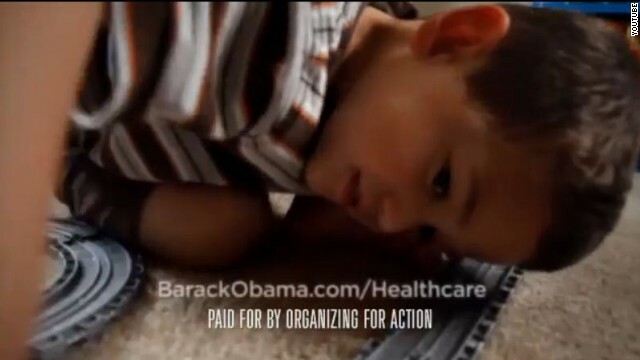 An OFA official confirmed that the ad will run on national cable channels, specifically Bravo and Lifetime, two channels whose viewers include high numbers of mothers. Administration officials and advocates of the ACA believe that mothers hold significant influence over their adult children’s decision whether to purchase health insurance. Young, healthy consumers – often called “young invincibles” – are crucial to the success of state insurance exchanges. To keep costs down and ensure that new state marketplaces succeed, the administration needs roughly 40 percent of new customers to be young and healthy. The Congressional Budget Office estimated that seven million people will purchase insurance on state exchanges during the six-month open-enrollment period beginning on October 1, which means the administration is hoping to enroll at least 2.7 million younger consumers. Finally somebody telling the. Truth, I'm getting really sick of the GOP lies and bs propaganda, like the grinch says, the GOP has no healthcare plan except if it benifits the insurance companies and not you.hey GOP,don't your kids need coverage till age 26 too???? Or do you want to pay for it yourselves,GOP morons!!!!!! Everybody knows the GOP has no creditibility on healthcare for you and me. They only care about their free healthcare they get payed for by you and me the taxpayers while they pay nothing. The GOP is just a bunch of stooges for the insurance and oil companies!!!!!! Thank you Mr. President for extending health care to all. That you god for giving us a president that care for us small ppl. He is a gift from god. If you listen real close you can hear a republican having a heart attack....good thing obamacare covers that. The rethugs have nowhere to go but to start digging their own graves. The people who are already using Obamacare are happy campers. Try to take that away. Propaganda bought and brought to you by the OFA. The same people who charge hundreds of thousands for an 'exclusive' meeting with Obama.